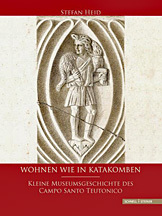 Announcing a new Roman catacomb publication, Wohnen wie in Katakomben : Kleine Museumsgeschichte des Campo Santo Teutonico, by Mons. Stefan Heid, professor of liturgy and hagiography at the Pontifical Institute of Christian Archaeology and director of the Römischen Instituts der Görres-Gesellschaft (Vatican). This is a history of the private collection of early Christian medieval objects that was founded in 1876 by Fr. Anton de Waal (1837-1917), director of historical and archaeological studies at the Vatican's Teutonic College. Included in the small but extremely significant collection are grave inscriptions, sarcophagi, lamps, vials, jars, coins, stamped bricks, and more. De Waal obtained these pieces from the Roman antiquities market as well as from excavations in course and private donation. The collection is housed in the Chapel of the Confraternity of Our Lady of Sorrows (Santa Maria della Pietà) in The Teutonic College's Camposanto. Heid's publication can be ordered here: http://www.schnell-und-steiner.de/artikel_8878.ahtml.